Charles Bernstein is one of America’s liveliest advocates and practitioners of radically inventive poetry. So why does he have a beef with National Poetry Month? A nationwide celebration of his craft during the entire month of April—what’s not to like? Plenty, says Bernstein. In an essay titled "Against National Poetry Month As Such&quot he writes: National Poetry Month is about making poetry safe for readers by promoting examples of the art form at its most bland and its most morally "positive." The message is: Poetry is good for you. But, unfortunately, promoting poetry as if it were an "easy listening" station just reinforces the idea that poetry is culturally irrelevant and has done a disservice not only to poetry deemed too controversial or difficult to promote but also to the poetry it puts forward in this way. "Accessibility" has become a kind of Moral Imperative based on the condescending notion that readers are intellectually challenged, and mustn’t be presented with anything but Safe Poetry. As if poetry will turn people off to poetry. Read the rest of "Against National Poetry Month As Such." Bernstein is perhaps best known as one of the founders of the L=A=N=G=U=A=G=E poetry movement of the . . . Examining Genesis in a philosophical light, Kass presents it not as a story of what happened long ago, but as the enduring story of humanity itself. 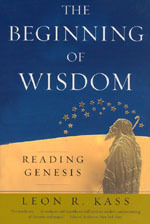 He asserts that the first half of Genesis contains insights about human nature that "rival anything produced by the great philosophers." Kass here reads these first stories—from Adam and Eve to the tower of Babel—as a mirror for self-discovery that reveals truths about human reason, speech, freedom, sexual desire, pride, shame, anger, and death. Taking a step further in the second half of his book, Kass explores the struggles in Genesis to launch a new way of life that addresses mankind’s morally ambiguous nature by promoting righteousness and holiness.… Read the press release. Read an excerpt. . . .
Chemistry World recently reviewed Theodore Arabatzis’s Representing Electrons: A Biographical Approach to Theoretical Entities. From the review by Dennis Rouvray: "erhaps the most disconcerting message contains is that no experiement has indubitably established the existence of the electron. The author of this thought-provoking work is to be congratulated both for challenging some of our most cherished assumptions and for reminding us that the world of chemistry is not nearly as cut and dried as most chemists would have us believe." Both a history and a metahistory, Representing Electrons focuses on the development of various theoretical representations of electrons from the late 1890s to 1925 and the methodological problems associated with writing about unobservable scientific entities. Using the electron—or rather its representation—as a historical actor, Arabatzis illustrates the emergence and gradual consolidation of its representation in physics, its career throughout old quantum theory, and its appropriation and reinterpretation by chemists. As Arabatzis develops this novel biographical approach, he portrays scientific representations as partly autonomous agents with lives of their own. Furthermore, he argues that the considerable variance in the representation of the electron does not undermine its stable identity or existence. . . .
Publishers Weekly recently reviewed David S. Brown’s Richard Hofstadter: An Intellectual Biography. 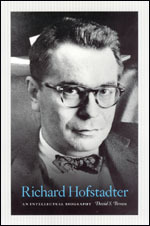 From the review: "Richard Hofstadter wrote several of the 20th century’s most popular and important works of American history, but, as historian Brown reminds readers in this nuanced study, those works were as much a critique of the political culture of his own day as they were an analysis of the past. brief, pointed readings of the Columbia-based thinker’s books and analyses of his era’s conflicts…. As he makes a strong case for the relevance of Hofstadter’s influential understanding of political conflict to contemporary society, Brown is attentive to his flaws, as well: most notably, his personal devotion to postwar, meritocratic liberalism often led him to apply and selectively develop his historical arguments. Although the Hofstadter estate’s prohibition against quotation from his letters weakens the presentation of his inner life, Brown’s thorough research has yielded plenty of well-chosen snippets from the words of Hofstadter’s family, colleagues and students to flesh out this valuable intellectual portrait." Read an excerpt. . . .
"Who Is Not a Fool?" Why do jesters show up almost everywhere, from the courts and tribes of ancient China and the Mogul emperors of India to those of medieval Europe, Africa, the Middle East, and the Americas? The universal jester is surveyed in Fools Are Everywhere: The Court Jester Around the World by Beatrice K. Otto. Written with wit and humor, Fools Are Everywhere is the most comprehensive look at these roguish characters who risked their necks not only to mock and entertain but also to fulfill a deep and widespread human and social need. Prepare for April 1 with an excerpt and an interview with the auhor. . . . Earlier this month, as part of its coverage of the European Fine Art Fair (TEFAF Maastricht), the European edition of the Wall Street Journal featured their top picks for "readings on art for collectors." Duveen: A Life in Art by Meryle Secrest made the list. 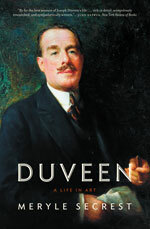 Regarded as the most influential—or, in some circles, notorious—dealer of the twentieth century, Joseph Duveen (1869-1939) established himself selling the European masterpieces of Titian, Botticelli, Giotto, and Vermeer to newly and lavishly wealthy American businessmen—J. P. Morgan, John D. Rockefeller, and Andrew Mellon, to name just a few. It is no exaggeration to say that Duveen was the driving force behind every important private art collection in the United States. The key to Duveen’s success was his simple observation that while Europe had the art, America had the money; Duveen made his fortune by buying art from declining European aristocrats and selling them to the "squillionaires" in the United States. . . . The New Scientist has praised Dorrik Stow’s Oceans: An Illustrated Reference. From the review by Adrian Barnett: "From sun-drenched atolls to the ice-capped Arctic, Oceans provides a photo-packed history of the seas, their geology, geochemistry and physics, their cycles and circulations. In elegant prose, Stow examines marine life in all its glorious strangeness and extreme abundance. He covers major areas of oceanographic research, including sociology, anthropology and archaeology, revealing how much we know, and the enormous amount we don’t. Helped by lots of colour photographs and explanatory diagrams, charts and maps, this is a splendid, fact-packed read." . . .
Smith on AAUP’s "Iraq book list"
Since Iraq continues to be the daily focus of international news, the Association of American University Presses (AAUP) has just announced the timely release of an updated and revised version of its "Iraq book list" at Books for Understanding. The comprehensive list "guides journalists, librarians, and other researchers to the best scholarship now available." Included on this list is Philip Smith’s new book, Why War? : The Cultural Logic of Iraq, the Gulf War, and Suez. Comprised of case studies of the War in Iraq, the Gulf War, and the Suez Crisis, Why War? decodes the cultural logic of the narratives that justify military action. Each nation, Smith argues, makes use of binary codes—good and evil, sacred and profane, rational and irrational, to name a few. These codes, in the hands of political leaders, activists, and the media, are deployed within four different types of narratives—mundane, tragic, romantic, or apocalyptic. With this cultural system, Smith is able to radically recast our "war stories" and show how nations can have vastly different understandings of crises as each identifies the relevant protagonists and antagonists, objects of struggle, and threats and dangers. Read an excerpt. View the AAUP’s Iraq book list. . . .
"There is something both marvelous and hilarious," writes Lawrence Weschler, "in watching the humdrum suddenly take flight. This is, in part, a collection of such launchings." 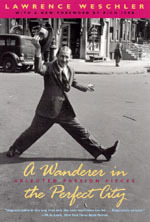 Indeed, the eight essays collected in A Wanderer in the Perfect City do soar into the realm of passion as Weschler profiles people who "were just moseying down the street one day, minding their own business, when suddenly and almost spontaneously, they caught fire, they became obsessed, they became intensely focused and intensely alive." With keen observations and graceful prose, Weschler carries us along as a teacher of rudimentary English from India decides that his destiny is to promote the paintings of an obscure American abstract expressionist; a gifted poker player invents a more exciting version of chess; an avant-garde Russian émigré conductor speaks Latin, exclusively, to his infant daughter; and Art Spiegelman composes Maus. But simple summaries can’t do these stories justice: like music, they derive their character from digressions and details, cadence and tone. 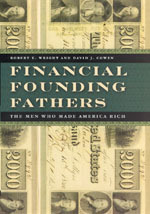 And like the upwelling of passion Weschler’s characters feel, they are better experienced than explained.… Read the press release. . . .
Library Journal recently reviewed Robert E. Wright and David J. Cowen’s Financial Founding Fathers: The Men Who Made America. From the review: "The early financial history of the United States merits additional popular and scholarly attention, and Wright and Cowen provide biographical information on nine founders of America’s financial and economic systems, from Alexander Hamilton to Andrew Jackson and Nicholas Biddle.… The book emphasizes biographical information with limited explanation of financial and economic arguments.… This book is useful for large public libraries so that general readers may understand formative economic ideas in American history." Robert E. Wright and David J. Cowen chronicle how a different group of founding fathers forged the wealth and institutions necessary to transform the American colonies from a diffuse alliance of contending business interests into one cohesive economic superpower. From Alexander Hamilton to Andrew Jackson, the authors focus on the lives of nine Americans in particular—some famous, some unknown, others misunderstood, but all among our nation’s financial founding fathers. Read an excerpt. Visit Wright and Cowen’s Financial Founding Fathers Web site. . . .